It is so good to be here with all of you. And yes I will be calling on people. Mostly those of you standing in the back. I always know why people are standing in the back. That’s what teachers do. Professional-class dominance games aside, it’s evident that Warren is comfortable here. These are her people. And I would urge that, no matter what policy position she might take on the trail, these policies and this program are her “center of gravity,” as it were. Push her left (or, to be fair, right) and, like a bobo doll, she will return to this upright position. So, to the text (all quotes from Warren from the transcript). I’ll start with two blunders, and then move on to more subtle material. Thank you to the New America Foundation for inviting me here today to talk about the gig economy… You know, across the country, new companies are using the Internet to transform the way that Americans work, shop, socialize, vacation, look for love, talk to the doctor, get around, and track down ten‐foot feather boas, which is actually my latest search on Amazon…. Uber and Lyft, two ride‐sharing platforms came onto the scene about five years ago, radically altered this model, enabling anyone with a smartphone and a car to deliver rides…. The result was more rides, cheaper rides, and shorter wait times. The ride‐sharing story illustrates the promise of these new businesses. And the dangers. Uber and Lyft fought against local taxi cab rules that kept prices high and limited access to services…. And while their businesses provide workers with greater flexibility, companies like Lyft and Uber have often resisted efforts of those very same workers to try to access a greater share of the wealth that is generated from the work that they do. Their business model is, in part, dependent on extremely low wages for their drivers. The financial tables below are based on private financial statements that Uber shared with investors that were published in the financial press on three separate occasions. The first set included data for 2012, 2013 and the first half of 2014… The second set included tables of GAAP profit data for full year 2014 and the first half of 2015; the third set included summary EBITAR contribution data for the first half of 2016.…. [F]or the year ending September 2015, Uber had GAAP losses of $2 billion on revenue of $1.4 billion, a negative 143% profit margin. Thus Uber’s current operations depend on $2 billion in subsidies, funded out of the $13 billion in cash its investors have provided. Now, in Warren’s defense, it is true that she, on May 19, 2016, could not have had the benefit of Horan’s post at Naked Capitalism, which was published only on November 30, 2016. However, I quoted Horan’s post at length to show the dates: The data was out there; it wasn’t a secret; it only needed a staffer with a some critical thinking skills and a mandate to do the research to come to the same conclusions Horan did, and Uber’s lack of profitabilty, information that is easily accessible, is a ginormous red flag for anybody who takes the idea that Uber “generates wealth” seriously. How is it that the wonkish Warren is recommending policy based on what can only be superficial research in the trade and technical press? Should not the professor have done the reading? First, make sure that every worker pays into Social Security, as the law has always intended. Right now, it is a challenge for someone who doesn’t have an employer that automatically deducts payroll taxes to pay into Social Security. This can affect both a worker’s ability to qualify for disability insurance after a major [injury], and it can result in much lower retirement benefits. If Social Security is to be fully funded for generations to come, and if all workers are to have adequate benefits, then electronic, automatic, mandatory withholding of payroll taxes must apply to everyone, gig workers, 1099 workers, and hourly employees. Again, is it too much to ask that a professor do the reading? After all, MMT gotten plenty of traction, even in 2016. The Sanders staff, for example, could have been helpful to her. As greater wealth is generated by new technology, how can we ensure that the workers who support the economy can actually share in the wealth? Well, I believe we start with one simple principle. All workers, no matter where they work, no matter how they work, no matter when they work, no matter who they work for, whether they pick tomatoes or build rocket ships, all workers should have some basic protections and be able to build some economic security for themselves and their families. No worker should fall through the cracks. And here are some ideas about how to rethink and strengthen the worker’s bargain. We can start by strengthening our safety net so that it catches anyone who has fallen on hard times, whether they have a formal employer or not. And there are three much‐needed changes right off the bat on this. These three, Social Security, catastrophic insurance, and earned leave, create a safety net for income. Now, the second area of change to make is on employee benefits, both for healthcare and retirement. To make them fully portable. They belong to the worker, no matter what company or platform generates the income, they should follow that worker wherever that worker goes. And the corollary to this is that workers without formal employers should have access to the same kinds of benefits that some employees already have. I want to be clear here. The Affordable Care Act is a big step toward addressing this problem for healthcare. Providing access for workers who don’t have employer‐sponsored coverage and providing a long term structure for portability. We should improve on that structure, enhancing its portability, and reducing the managerial involvement of employers. I endorsed Bernie Sanders’ Medicare for All bill because it lays out a way to give every single person in this country a guarantee of high-quality health care. Everybody is covered. Nobody goes broke because of a medical bill. No more fighting with insurance companies. This is a goal worth fighting for, and I’m in this fight all the way. There are other approaches as well…I’m glad to see us put different ideas on the table. Massachusetts has the highest rate of health insurance coverage in the nation. We are the healthiest state in the nation. That didn’t just happen because we woke up one morning and discovered that insurance companies had just started offering great coverage at a price everyone could afford. We demanded that insurance companies live up to their side of the bargain. Every insurer participating in our exchange is required to offer plans with standard, easy-to-compare benefits and low up-front costs for families. Last year, we had the second-lowest premiums in the ACA market of any state in the country. Massachusetts insurers pay out 92% of the dollars they bring in through premiums to cover costs for beneficiaries – not to line their own pockets. The rules are tough in Massachusetts, but the insurance companies have shown up and done the hard work of covering families in a responsible way. We have more than double the number of insurers participating on our exchanges, compared to the average across the country. They show up, they serve the people of Massachusetts, and they still make plenty of money. Look, we still have plenty of work to do, particularly when it comes to bring down health spending, but we’re proud of the system we have built in Massachusetts, and I think it shows that good policies can have a real impact on the health and well-being of hard working people across the country. Never mind that Warren can say, virtually in the same breath, that insurance companies “still make plenty of money” and “we have plenty of work to do… to bring down health care spending.” RomneyCare was the beta version of ObamaCare. We tried it, as a nation, starting in 2009, and here we are. If that’s what Warren wants, fine, but why not simply advocate for it? But it is policy, rules and regulations, that will determine whether workers have a meaningful opportunity to share in the wealth that is generated. Antitrust laws and newly‐created public utilities addressed the new technological revolution’s tendency toward concentration and monopoly, and kept our markets competitive. Rules to prevent cheating and fraud were added to make sure that bad actors in the marketplace couldn’t get a leg up over folks who played by the rules. Workers have a right to expect our government to work for them. To set the basic rules of the game. If this country is to have a strong middle class, then we need the policies that will make that possible. That’s how shared prosperity has been built in the past, and that is our way forward now. Change won’t be easy. But we don’t get what we don’t fight for. And I believe that America’s workers are worth fighting for. Every worker should have the right to organize, period. Full‐time, part‐time, temp workers, gig workers, contract workers, you bet. Those who provide the labor should have the right to bargain as a group with whoever controls the terms of their work…. Government is not the only advocate on behalf of workers. It was workers [here we go], bargaining through their unions [and the qualification], who helped [helped?] introduce retirement benefits, sick pay, overtime, the weekend, and a long list of other benefits, for their members and for all workers across this country. Unions helped build America’s middle class, and unions will help rebuild America’s middle class. To understand what happened at Haymarket, it is necessary to go back to the summer of 1884 when the Federation of Organized Trades and Labor Unions, the predecessor of the American Federation of Labor, called for May 1, 1886 to be the beginning of a nationwide movement for the eight-hour day. This wasn’t a particularly radical idea since both Illinois workers and federal employees were supposed to have been covered by an eight-hour day law since 1867. The problem was that the federal government failed to enforce its own law, and in Illinois, employers forced workers to sign waivers of the law as condition of employment. Monday, May 3, the peaceful scene turned violent when the Chicago police attacked and killed picketing workers at the McCormick Reaper Plant at Western and Blue Island Avenues. This attack by police provoked a protest meeting which was planned for Haymarket Square on the evening of Tuesday, May 4. Very few textbooks provide a thorough explanation of the events that led to Haymarket, nor do they mention that the pro-labor mayor of Chicago, Carter Harrison, gave permission for the meeting…. Most speakers failed to appear…. Instead of the expected 20,000 people, fewer than 2,500 attended…. The Haymarket meeting was almost over and only about two hundred people remained when they were attacked by 176 policemen carrying Winchester repeater rifles. Fielden was speaking; even Lucy and Albert Parsons had left because it was beginning to rain. Then someone, unknown to this day, threw the first dynamite bomb ever used in peacetime history of the United States. The next day martial law was declared, not just in Chicago but throughout the nation. Anti-labor governments around the world used the Chicago incident to crush local union movements. This is how workers “helped introduce” the eight-hour day. Warren is far stronger in areas where she has developed academic expertise than in areas where she has not. Google is Google, i.e., crapified, but if Warren has retracted or changed her views on Uber, I can’t find it. She was receiving good press for this speech as late as August 2017. Oddly, bankruptcy is where Warren made her academic bones. I’m frankly baffled at her lack of full-throated advocacy on this, especially before a friendly audience. Warren, by juxtaposition, suggests that Massachusetts’ health insurance coverage causes it to be “the healthiest state in the nation.” This post hoc fallacy ignores, for example, demographics and the social determinants of health. Warren focuses on health insurance, not health care. I’m nothing like an expert in the Massachusetts health insurance system. However, looking at this chart, I’m seeing all the usual techniques to deny access to care: Deductibles, co-pays, out-of-network costs, and (naturally) high-deductible plans. Health care should be free at the point of delivery. Why is that so hard to understand? This entry was posted in Politics on January 20, 2019 by Lambert Strether. I quickly went over the (188 page!) report referenced in Warren’s claim that “Massachusetts has the highest rate of health insurance coverage in the nation. We are the healthiest state in the nation”. It should be noted I went in with the expressed purpose of finding something to be snarky about, and I found it. One of the metrics under “core measures” of clinical care was Preventable Hospitalizations. As it states in the report itself: “Preventable hospitalizations reflect the efficiency of a population’s use of primary care and the quality of the primary health care received…Preventable hospitalizations are more common among people without health insurance and often occur because of failure to treat conditions early in an outpatient setting”. Wow! With such bang up health insurance in MA, one would figure they would do great on this metric. Nope! MA ranks 37th in the country. Many more such examples can be found, I’m sure. I have a real dislike of these “who’s best” lists, regardless of topic. Rarely do they (the aggregated ratings) contain insight beyond that captured by the individual metrics. Massachusetts is #1 on mortality (though they have issues with opioids). They have median US age, so it’s not the enormous Boston student population. So they’re doing something right, I’m just not sold it’s health insurance or, more to the point, health insurers. They do have more physicians (and psychiatrists) per capita. What is “mortality” in this case? I’m curious about this because people often casually say that US health outcomes are worse than in other countries by looking at life expectancy (which I guess is not the same as mortality), and that comparison is rarely done on a state by state basis in the US. Massachusetts is roughly tied with the other top ten states in life expectancy, which are almost all “blue” states. Worldwide, life expectancy among highly developed countries is roughly similar, within a few years of each other. The US comes out towards the bottom (no. 31), but only by about 1-3 years. Also amazed just now to see that Asian American and Latino life expectancy are so much higher than for white and black Americans. Does anyone know anything about that? I’m really stunned. Usually, lower life expectancy for blacks is given as evidence of inequality, but the white-black gap (about 1-2 years) is tiny compared with the black-Latino and black-Asian gap, or for that matter, the white-Latino or white-Asian gap, which are more like 5-10 years. I’m really floored by that. In general, looking at the numbers just now has shaken my assumptions about poor US life expectancy and also racial disparities and I’m wondering if I’m misinterpreting them. Apparently there is something called the “Hispanic Health Paradox” that has been studied intensively for over 30 years. The biggest reason seems to be much lower rates of smoking. There also seems to be a filtering effect whereby healthier people migrate to the US. Anecdotally, I’d suggest much lower rates of alcohol and drug abuse, but the article doesn’t mention that. So, why Mass. has a relatively high life expectancy could in part be due to it having one of the earliest and most aggressive anti-smoking movements. I’m guessing historically high smoking rates (up to 50% of adults in the 1950s with huge second-hand exposure) could also account for poorer health outcomes today. One of my favorite pictures (the one I have not yet taken) would have been an elevated shot of the intersection at Longwood and Brookline Avenues (379–385 Brookline Ave) at noon on a clear, sunny spring day to see the murmuration of medical staff running between appointments, lunch, rounds, etc. The intersection is surrounded by arguably some of the finest medical institutions in the Western world (Beth Israel Deaconess, Dana-Farber, Brigham & Women’s (where Atul Gawande, author of the book “Better” and the whole entire concept of positive deviance, once held court), Harvard Medical School itself with its etched-in-granite entrace to the Countway Library that reads “Ars Longa, Vita Brevis”, and the Harvard School of Public Health. The murmuration of white coats may be at that moment the greatest single concentrated density of medical excellence at one time. It is easy to scoff. I’ve been the recipient of bad medicine myself, but also far more high-quality, life-saving medicine. But the public health movement in Massachusetts has been around for a very long time and is supported by and engrained within governmental regulations, oversight and policy. Insurance plans covering most of the state ranked, typically and for years, #’s 1, 2, 3 and more. The Healthcare Effectiveness Data and Information Systems report out results that are painstakingly gathered, audited to improve performance. It is fair to say that a major part of the intersection between computing and medicine was born and is overseen across the river in Cambridge. Organizations that collect or audit data for health plans and providers are screened, trained and certified by NCQA ( https://www.ncqa.org/about-ncqa/ ). In addition, there are national, regional and state associations devoted to quality improvement and toi improvement of access. The National Association of Community Health Centers (those clinics funded Federally to serve the under-served for free or on a sliding scale) “works in conjunction with state and regional primary care associations, health center controlled networks and other public and private sector organizations to expand health care access to all in need.” There are CHC’s dotted everywhere around the country (albeit not enough of them), and there is a state association in almost every state. No one can ever be turned away from a CHC, especially for lack of ability to pay; the Federal government underwrites their care. govts can call force us to call toilet paper a pound, but i doubt they can make it worth a pound of sterling silver – if they pretend that they can produce any amount. You need to get some treatment for that knee. If government printed a trillion-dollar bill on toilet paper, then accepted it in payment for a trillion dollars of taxes, it would be worth a trillion dollars. Can they produce any amount? What’s the limit on how many points the scorekeeper at the ballgame can produce? Same limit for the government. The real economy limits how useful the dollars are, but there is no real limit to how many that government (with sovereign, fiat currency and a floating exchange rate) can produce….just as there is no real limit to how many zeros it can add to the accounting for a bank account (where most of the money resides). Warren’s emphasis on the economic market for health “care?” (insurance companies making plenty of money) and particularly her whole rant on the superlatives of Massachusetts insurance care (that means, care for insurance companies) , increasingly neglects health and people care as the primary concern of medicine and the people who practice it. As an average Joe, meaning not part of the medical world, I have come across a surprising number of doctors in both social circumstances as well as health issues of my own and of my extended family, where doctors have complained about the ever worsening constraints imposed on them by insurance companies. I know at least three doctors who retired early because of it and one of them talks about it being a significant problem in keeping highly qualified doctors in general practice. From ever more ridiculously short visits, to constant refusal to cover such and such a drug, to all manner of schemes to improve patients health by overseeing and controlling what the doctor does to finding ways to monitor what the patient does; what he or she takes as medicine and exactly when and how often – cutting the doctor out of the loop completely. Improve the patient experience my *ss. It’s horrible and it all comes down to ever new ways to reduce coverage – to make more money. Perhaps I’m being a little unjust, but Warren seems fine with this “system” where the gate keepers make, “plenty of money,” as long as people are going in and out of doctors’ offices in countable droves as if on run-away conveyer belts. I should at least allow that many of her superlative claims are accurate (or somewhat accurate) and that there is fairly wide coverage in this state but nevertheless stress that our excellent medical facilities in Boston proper are due to historical reasons and NOT to RomneyCare. Thank you Lambert, for your cogent and discerning analysis as always. I’ve long ago disabused myself of the notion that E. Warren is more than “lipstick” on the usual “pig”, but it was good to have written support for that thesis and I will save it for my reference. What worries me more though is Sanders’s bill…and why he wouldn’t go all the way?… Would you do an analysis of that please – will really appreciate it. > why he wouldn’t go all the way?… Would you do an analysis of that please – will really appreciate it. I think he’s calculated what can make it through the Senate. But I think he’s negotiating with himself. Still waiting for Jayapal’s bill. Sanders has given Jayapal the blueprint for crapifying HR-676. Bernie’s bill seriously damages his credibility, and that’s too bad. I’m hoping that single payer proponents like PNHP and Russell Mokhiber can, with the support of the public, persuade Sen. Sanders to align his proposal to be more like HR 676—which would be in keeping with his call for “revolution.” I’m not sure that, at that point, Bernie wants to be on the wrong side of the issue and against some of the staunchest proponents of single payer. But that might be a bit optimistic. The vast majority of Massachusetts health plan providers are nonprofit HMOs so I’m baffled by the idea that they are making tons of money since legally they are not supposed to. The most obvious difference between Mass and the rest of the country is precisely the preponderance of nonprofit health plans (it’s not commonly called health insurance here) and nonprofit hospitals. The idea of for-profit health plans and hospitals freaks me out. It’s worth noting that Mass health coverage seems to have gotten worse in recent years, though I don’t know how much of that is due to Obamacare. High deductibles, coinsurance, confusing in-network requirements combined with poor documentation and even poorer customer service to tell you what is in-network and what is not. I just got a surprise $370 bill for a provider that supposedly was out of network even though I had checked extensively that they were in-network. That is the first time that has ever happened to me in Mass. Not to mention the confusing and unnerving notices I got the last few months saying I was in danger of losing coverage. A great big ball of Weberian beaureaucratic stress. The final retirement package for former Excellus BlueCross BlueShield CEO David Klein likely will exceed — by millions — the $12.9 million the company reported to the state in March. $29.8 Million in retirement. Non-profit for who? It’s a complete misnomer and a huge problem in the discourse of healthcare. Hospitals are usually non-profits too. They non-profitly charge you $80,000 for a few stitches and some aspirin. Health Care Economist / Professor Uwe Reinhardt used to comment that in the current system non-profit hospitals (The Sisters of Mercy, with a token nun on their board, in his telling) were subject to the same forces as for profit hospitals. He also said Massachusetts has the only adult health care system, and the other states are all adolescents. We’ve got for-profit hospitals…cerberus took the caritas network. The hospitals dominate this state. The rest of us are just living here. Special thanks to the catholic church for selling such an important institution to a monster that guards the gates of the underworld. I bet it was to cover the costs of child predator priests. Sad but true. Render under Cerberus…. where is our Dante — or Joseph Heller? Wow, I’d missed that (moved out of state, then came back). Thanks for the update. It looks like the Catholic Church (former owner of Caritas) has further enhanced its legacy in Massachusetts. However, I believe it is still true that the hospital market in Mass. is dominated by nonprofits (albeit greedy nonprofits). And yes, hospitals and hospital chains (e.g., Partners Healthcare, which is nonprofit) pose huge challenges to managing healthcare costs in Mass. as the numerous Boston Globe investigative series attest, by using their market power to raises prices. My concern is when the market becomes dominated by for-profit actors, the profit-seeking, which is already bad with nonprofits, becomes even worse, especially in an ultra-expensive market like Greater Boston. I think the phenomenon is closer to that of the mega-corporation wherein the competition is underway to see who can, by being the biggest on the block, race on ahead into a monopooly. Once a monopoly is achieved, with bennies in terms of negotiaiton with vendors and especially payors, the capitalism becomes a totalitarian glop. Non Profit is just a label applied to organizations based on IRS regulations. It doesn’t mean they don’t make a profit. They just increase the “reserve”. I should add (if my earlier comment get’s posted), it’s even more surprising how many doctor’s seem just fine with all the negative changes being brought about by insurance companies’ intrusive quest for control and I don’t mean just the ones who say nothing. That is, some doctors seem to enjoy the vestiges of the glow of community respect and honor that once went with being a doctor all while doing almost nothing other than sheep herding patients through the office in good file while staff (not the good doctor) attend to making the visit digital and storing it away in some cloud. I agree with Warren Mosler that Elizabeth Warren’s apparent ignorance of MMT, much less mastery of it, makes here a lame candidate in my book. She needs to get woke pretty quickly or settle for some cabinet appointment. It’s more important than ‘scripture’ … it’s how sovereign fiat money actually works. No. Why would you think so? You don’t even need MMT. When asked how the federal government can pay for something, people can just answer, “the same way we pay for military and intelligence spending.” Any politician who won’t say at least this is deeply suspicious. That’s the way to go rhetorically, I think. Let those who have been printing money for banks and wars explain and defend it (if one has to do so)—they’re the ones who have been implementing MMT in practice for years. I think that’s her level (or Veep), and I think that’s a level where good work can be done. I don’t trust her political judgment (Cherokee debacle) and I don’t trust her habits of thought (markets first), but there’s no question she’s a skilled bureaucratic infighter, and those talents could be put to use for a better cause. Sanders needs a Cheney (but without Cheney’s twisted sneer, and all it implies (I mean, Warren, for all her faults, never shot an old man in the face, and then got him to apologize for getting in the way)). Warren for Bernie’s Veep sounds good to me. but she might reassure ‘centrist’ Dem voters and get them on board for Bernie. If the objective is for a candidate who can bear Trump, just put “None of the above” on the ballot and that will do it. That way we don’t have to play the “lesser of the evils” game. but I would love to elect Prez Bernie. Who would make better use of that bully pulpit? Imagine how far Prez Bernie could go to educate the public? which is far far left! Bernie is the lesser of two (or however many) evils in some ways though (with certainty on foreign policy and probably how he would realistically govern), so it’s just a question of when there is enough good to vote for someone. I don’t either—and there ‘s something about her emphasis on rules, policies and procedures I don’t like either. If everything can just be made “fairer” (“play by the rules”) and more “transparent,” then everything is just darn swell. It negates and is oblivious to power relations. (You can see it even in terms of the Cherokee debacle which Warren viewed in terms of “transparency,” rather than as a power play/bullying.) She gets the surface manifestations but not the underlying dynamic—what appears on the surface is, for her, the problem. I’m glad that she’s out there, I’m glad that she’s talking, and we need an open and transparent nomination process, but Bernie Sanders remains the only (potential) nominee who comes close to representing my views. Good piece. The transcript could easily have been a speech by Hillary (and even delivered to Goldman Sachs if Hillary had had the foresight to realize that every speech would become known to everybody in the Internet age — before Russiagate was leveraged into Social media banning of anti-establishment speech). The speech’s date (May 19 2016), was two days after Bernie won the Oregon primary by 14%, and two days before Hillary won the Washington state primary by 5%. I kept hearing Warren’s words in Clinton’s voice. That said, on examination, she doesn’t speak or reason in the same way, at least when I’m doing a close reading of a text, so my reaction isn’t really a fair one. The Eric Schmidt who took Google down the primrose part of spying on everybody. And thanks for the reminder that the 8 hour workday and the 40 hour workweek were not ‘given’ to workers, they were won by workers. Thank you. I was really struggling with that part. I might try characterizing Warren’s theory of change more precisely in future, but workers winning (as opposed to having things won for them) does not seem to figure largely in her thinking. To me, that is the core liberal/left distinction. Which is why even something like Fight for $15 is really a liberal strategy, not a left one. isn’t it because the left strategies didn’t work in that case, attempts at unionization of fast food workers failed is my understanding. I made an a similar observation on my blog. Compare these two quotes on Pharma looting. Giant companies may hate my Affordable Drug Manufacturing bill – but I don’t work for them. The American people deserve competitive markets and fair prices. By fixing the broken generic drug market, we can bring the cost of prescriptions down. If the pharmaceutical industry will not end its greed, which is literally killing Americans, then we will end it for them. Tell me what about Warren not understanding how federal taxes work, which is fundamental to formulating sound fiscal policy and spending plans, not being serious about fixing our health care system, or praising the predatory gig economy, is “good”. The self-employed pay both the employee’s half of Social Security, and also pay a “Self-Employment tax” (the employer’s half of Social Security). The logic is that if you are both employee and employer, you should pay both halves. This is thread jacking, plus so what? If you are self employed or employer-employed, on your salary, what you get is a net wage. In fact, positioning the self employed as a victim of this arrangement is BS. The self employed can run way more expenses through their businesses than normal W-2 employees can and can minimize wages and take more as profit share. Help me. Or lesser of two evils? There really needs to be a good discussion again about reform versus structural change without Chait-like pretensions. The question isn’t just whether we’ll get there in time, but whether reform even out runs reaction. Once you take out patriotic myth, it’s not obvious whethervthe good in the long term is even worth bothering with. Warren 2020 campaign is DOA. If you want Trump for another four years go with Warren 2020. And the left (not neoliberal) is the enemy of liberals and conservatives (neoliberal). Your point? I can’t help but think that if you are talking about the “Next Social Contract”, them you should put something in there that if you have children going hungry then something has gone wrong with your society. Not being snarky here as I believe that a fundamental purpose of society is to protect those in need. An earlier society talked about ‘women and children first’ and they were not too far off the mark here. She was invited to talk about the gig economy but in reading her speech I was under the impression that she wants the Federal government to underwrite the costs of workers for corporations to ensure that maybe these workers have food to eat while working for these very same corporations. I suspect that this is the thinking behind letting Amazon workers go for Federal assistance for the sheer basics of life while Amazon makes off like bandits. No. The way to go is to enforce corporations like this pay a living wage and not to have them count on the country to make up the difference. If they start to protest, then start to talk about looking over their accounts for any discrepancies to make them back off. That’s how they got Al Capone you know. Not for being a gangster but for not paying his taxes while doing so. And do the same for mobs like Uber and Lyft and all the other corporations. This is a silly quotation from an extreme partisan gunsel. Sigh. Nail hit squarely on head. The one thing I will say to Warren’s credit is that she has learned in some specific ways that the world isn’t invariably the pure meritocracy that is so instinctively part of her world view. That said, it seems clear there will always be plenty that she is simply not capable of seeing, so she will always say and support things that are just wrong. She will not be leading the revolution. Yes. Warren’s “solutions” are penny-ante, even in her bold (heh) primary formulations. Well she is aware of the harm many are suffering and she will fight to remove that harm. It may be that Warren, like Clinton, is simply not a very imaginative person, and that extends to not being able to imagine what life is like outside her own class (as FDR for example was clearly able to do). (iii) counterpunch on Trump’s ‘rich-kid’ preferential entry into Wharton (or was it “affirmative action for attention deficit disorder victims”?). (b) The fattest side-of-barn target zone in the history of American politics. Oh come on. It isn’t just Harvard. No major law school has law faculty that doesn’t come from Harvard, Yale, or (sometimes) Columbia Law Schools. This is true even at places like Northwestern. And no one thinks Trump got where he got due to having gone to Wharton. He got money from his father and worked in his father’s business. She my not be imaginative enough for the elite pundits, but she is empathetic and in that she towers over any one else you can forsee as a candidate in 2020. >But it is policy, rules and regulations, that will determine whether workers have a meaningful opportunity to share in the wealth that is generated. Action for the Common Good. Thanks very much, Lambert. Such comparison-contrast analyses are really helpful in gaining an overall understanding of where candidates stand on key issues (well, key issues for progressives). My current impression is that all today’s front runners (Warren, Harris, Gillibrand, for example) represent variations on a theme – one will be more “liberal” than another on one issue, another on another, etc. No likely candidate appears to fully embrace Bernie-like policies down the line except Bernie. And that raises the specter of another intra-party struggle of the type we witnessed in 2016, which the British Labour party seems imho to be writhing under now (Brexit aside). Re: Warren as Veep/cabinet. Veep, I don’t think so, but cabinet-level appointment, yes. She could do solid work there. If you don’t understand that the way to ‘pay for’ Medicare for All is by CUTTING taxes to increase demand, then you aren’t considering the loss in profits/investment/marketing/employment that would result from lower prescription drug prices for drug companies and lower reimbursement rates for medical providers. We’re at close to 16% of GDP in healthcare costs. If we bring that down to 14% in a year or two (hardly super-ambitious compared to other countries), that’s a 2% cost savings to the non-medical sector, which is good, but it’s still a 2% reduction in GDP. We’re going to need a boost in demand to make up for that shortfall if we’re going to avoid recession. Also, Republicans use MMT every time they gain the White House. They immediately launch trillion dollar tax cuts to get the economy moving (well, mostly to help their buddies, but some of eventually trickles). If Dems don’t do that (and they don’t), then they’re fighting with one hand tied behind their back (yes, I know they prefer it that way, but the point is still salient for those who actually want to govern). MMT 2020: Because Republicans are going to do it anyway!!! Serious question: why wouldn’t the 2% transfer of wealth from the healthcare industry to everyone else be its own stimulus? Why would it just disappear from the economy? Or are you saying that most of that reduction comes from government rather than private spending? Yeah, if we look at ‘excessive’ health insurance premiums, plus paying large deductibles, as a tax, then the lowering of those premiums, deductibles, cost of prescription meds, etc., would be a tax cut. Mainly to the large working and middle class who are living paycheck to paycheck, so they would spend that ‘extra’ cash on food, clothes, fancier smart phones. Demand increases, just not in the insurance sector. GDP is a flawed measure and accepting a need to “avoid recessions” (as measured by GDP) is tying both hands behind your back. If involuntary unemployment was zero, median incomes were rising, and we were making progress addressing climate change, why should anyone care about aggregate GDP. The notion that GDP is a good proxy for those other things is not correct. GDP is a terrible measure for many reasons and should be dropped. GDP is a deeply flawed measure of the well-being of a nation. – It looks only at production, not at destruction of tangible goods. – It looks only at economy indicators. Other indicators are : amount of inequality, quality of education, amount of debt, work-life balance, unpaid work and more. – It never was intended as a well-being indicator, but as a productivity indicator by its inventor. Insurance, extortion, monopoly. All tried and true measures to maintain power. Don’t forget sabotage. And all with a veneer of justice. I’ve watched this circus closely for 50+ years. It has been on the road far too long and it’s so tattered and filthy now it’s like visiting a ruin. We need a clean slate. Squeaky clean. No “health insurance”, no implied threats, no monopolies, and no more mental glop for language. Our problems only seem insurmountable because the crumbling ideology of neoliberal capitalism is fighting to its last absurd breath. Can someone please tell me why? I want language that clearly shows that insurance and monopoly are at least first cousins if not half-sisters. Language that makes the connection between power and sabotage; between change and war. I am so sick of all the Lizzy-style verbiage I could puke. I really hope Bernie isn’t falling down this old rabbit hole. It’s not health insurance it’s extortion in the name of health. The public coffers should be paying for healthcare for all and drug companies hospitals and other overchargers should be regulated and sent to jail if the break the regulations. Here is a quote from Warren Mosler about taxes and spending. I don’t like to say that taxes don’t fund spending. The word fund is ambiguous. It’s better to say the government doesn’t need your money to be able to spend. But they need you not to have it so that they can spend. I’m getting ready to teach the Populists and Progressives in a week or two. Warren is just a classic, almost to the “t” reiteration of the 1890-1920 Progressives. These were, like the Populists, concerned with the problems posed by the sweeping changes in American economic life after the Civil War; but whereas the Populists, as Lambert notes, were a bottom up movement, with roots in self-help organizations like The Grange and the Farmer’s Alliance, the Progressives were overwhelmingly upper-middle class college-educated urbanites (and I mean here streetcar fancy places like Brookline or West Roxbury, not the slums in the South End or the old West End, e.g., to use a Boston Example) with a top-down model of how social change ought to occur. They were typically outright snobs, and had enormous blind spots with things like race and class — and also in complicated ways with gender. 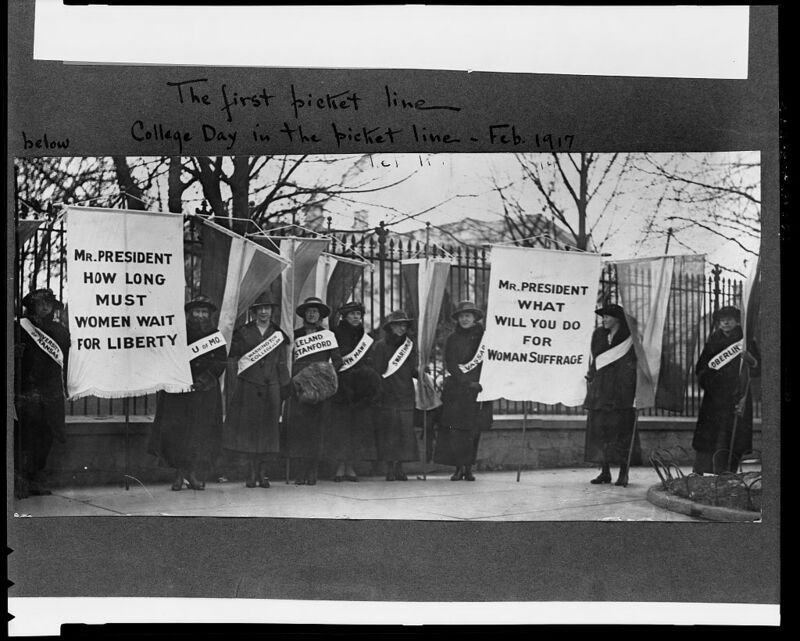 you see picketers in front of the White House during Wilson’s presidency, each of them wearing the name of their various alma maters — Oberlin, Bryn Mawr, Swarthmore, Stanford, the University of Missouri. It’s the lineal and direct ancestor of the credentialism which underlies the 10%er class liberal worldview of the NYT and MSNBC and The New Yorker. So we shouldn’t expect all that much from Warren, those of us who identify with what the 18th century called “the People Out of Doors” — many Progressives were outright horrible in important ways (Woodrow Wilson resegregated the Postal Service; Teddy Roosevelt was a crazed war-monger who was eager to get into WWI), and their modern counterparts will at best, come up lacking. EDIT: Sorry about the long link — I can’t quite figure out how to undo it, but hopefully the photo is available for perusal. I find the term earned leave distasteful. It implies that employees don’t deserve time off until they have sacrificed a certain amount of time to their employer. It has echoes of the deserving poor. Every time a politician uses the word “employee” I now substitute it with the word “vassal.” It’s a more accurate term for the employer-employee relationship in today’s world. if you thought 2016 was funny, Gillibrand vs. Trump is going to be a riot. This reads rather like a hit-piece. I just wanted to say that the healthcare system in Massachusetts worked out very well for me. I recently had heart failure at 35 years of age, likely due to poor genetics. I was laid off at the time, and was covered by MassHealth. The government paid for nearly everything- I stayed for 2 weeks at Beth Israel, in a large private room, with excellent 24/7 care. The staff was professional, and compassionate. The hospital was spotless. Even the food wasn’t too bad. They offered me mental health consultation, hooked me up with a cardiologist, a PCP, and got me appointments to an optometrist, and a nutritionist. They also paid for all my tests- blood work, echo cardiograms, diuretics, MRIs, everything. The only thing I paid for was my prescription drugs (I pay about $3 each refill for all 4 of my heart medications) and a CT scan (about $250). Everything was efficient, I didn’t have to deal with any paperwork, and I peed 80 pounds of fluids (I had crazy edema) in two weeks. It was an incredible experience.